Here are a few items I've seen and read in the past several months. 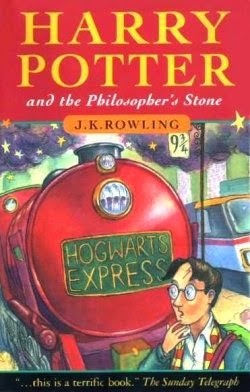 Harry Potter and the Sorcerer's Stone - Yes, I know, I'm the last person in the world to get around to reading the first Harry Potter book. At least I saw the movie version years ago. But my excuse is that I was waiting to read it with Jackson, who was six last summer when we read it. It's tough to argue against a book that seems to have improved literacy among an entire generation of kids. And it is a very entertaining book, although I was a little disappointed that more didn't happen in the story. It feels like author J.K. Rowling wanted to spread the plot out a little thin over the entire series to come. The evil Lord Voldemort kills James and Lily Potter. Son Harry is orphaned to the terrible Dursley family. Ten years later, Hagrid saves him and takes him to Hogwarts wizard school. Harry makes friends with Ron and Hermione and becomes a star Quidditch player. At the end, Dumbledore tells Harry that his mother sacrificed her life to save Harry, and Voldemort didn't understand such a thing as this - love. The Road - I also read and loved this Cormac McCarthy novel (my #56 all-time favorite) about a father and his son attempting to survive in a post-apocalyptic world gone mad. In the movie version from 2009, they walk down endless roads, just trying to survive, find food, and avoid flesh-eating gangs. It is unbearably sad, but probably as poignant an apocalypse movie as has ever been created. Anyone who's ever known the power of a father-son bond can't help but be moved. Daddy Day Care - I had no expectations when I started watching this kids film, but then I got into it almost immediately and loved it by the end. I mean, really, how wrong can you go with Eddie Murphy, Jeff Garlin, and a bunch of cute kids? Murphy is a marketing exec who gets laid off and, unhappy with his son's daycare run by Anjelica Huston, starts his own with fellow marketer Garlin. You could do much worse watching a movie with your kids.